Highly requested and slightly delayed, here it is: the adidas Busenitz ADV review. One of our personal highlights regarding shoe releases of 2013 finally made it onto the homepage in the English version. Please excuse the long wait and enjoy the read. Thanks again to our great team that didn’t settle with a “just fine” translation and correction. Street League, X-Games, Dew-Tour, the next big „un-core“ shoe company grabbing for a spot in the industry and the most recent Xtreme energy drink sponsor, they all seem to become increasingly important in our small but wonderful skateboard universe. With that said, it’s good to see that there are still some things that don´t change. When it feels like you’re floating further away from spaceship earth you need something to grab and feel safe. Dennis Busenitz is one of these constants in this universe that helps us restore faith in the future of skateboarding. New trends pass him by faster than he skates and he keeps it simple, clean and original. Plus, there’s no possibility of stopping him if he can film a whole jaw-dropping part where the only thing he’s skating is a 3-inch high curb. Fittingly, his newest and well-deserved signature model, the adidas Busenitz ADV keeps it simple and clean, but doesn’t lack originality. Due to a lack of red curbs the shoe’s ability to help with your slappy grind game wasn’t evaluated, all remaining questions regarding the performance of the Busenitz ADV are answered below. The adidas Busenitz ADV fits a little larger than usual. One of the strengths of the Busenitz ADV is its simple design. With no overlapping seams and the usage of high-quality suede, the performance of the shoe is greatly elevated. This of course isn´t some revolutionary engineering technique that adidas brought to the market out of the blue, but with that said, the ADV manages to take it one step further. 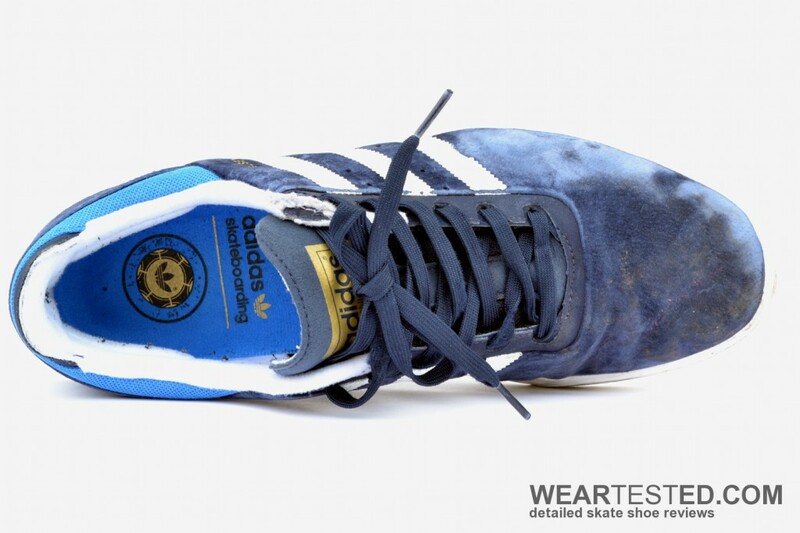 First of all, the three stripes logo is heat-transferred which majorly increases its durability. Additionally, the seamless connection between main-part and eyestay by a hidden seam in combination with the recessed eyelets greatly improves the lifespan of the shoelaces. Furthermore, the ventilation holes are placed between the stripes and are thereby protected from the abrasive griptape. Another smart detail is the fact that said holes are bigger on the medial side and smaller on the lateral side to account for the occurring abrasion in the respective region. The only flaw of the design is the mesh collar, which frays out quickly and doesn’t look appealing within hours. 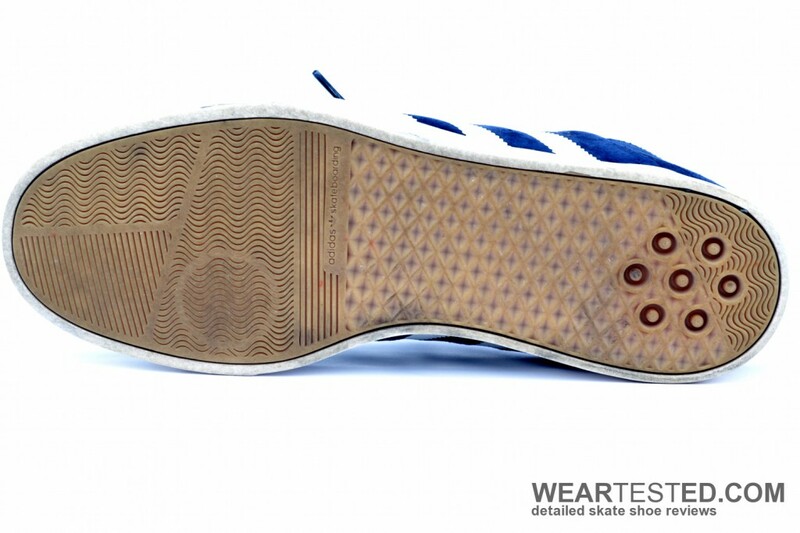 The relatively fine tread pattern of the sole would lead you to believe that it wears out quite fast, but it in fact did not show a single bald spot after the 10h of testing. Still, it may be one of the weaknesses in the long term. The sidewalls of the sole seem thin at first, but manage to withstand the griptape abuse quite well. Even though the differences between vulc and cupsole constructions seem to fade off more and more, when it comes down to cushioning, cupsoles usually take the cake. The Busenitz ADV is no exception. The cushioning is far above average, thanks to a rather higher sole construction in the heel area and the additional EVA-foam inlay. However, the absence of a foamed midsole in the center and front-area reduces the model’s ability to dampen high impacts in these regions. Due to the thickly cushioned collar and the high cut around the ankle and Achilles tendon, the Busenitz ADV has a slightly wider silhouette. 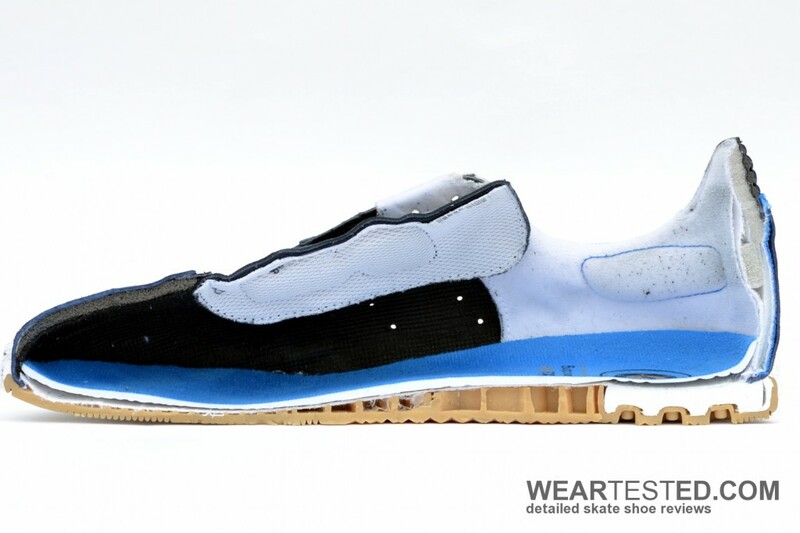 However, it still fits very snug and tight, and the toebox that tapers slowly to a rather pointy toe helps to control fliptricks extremely well. 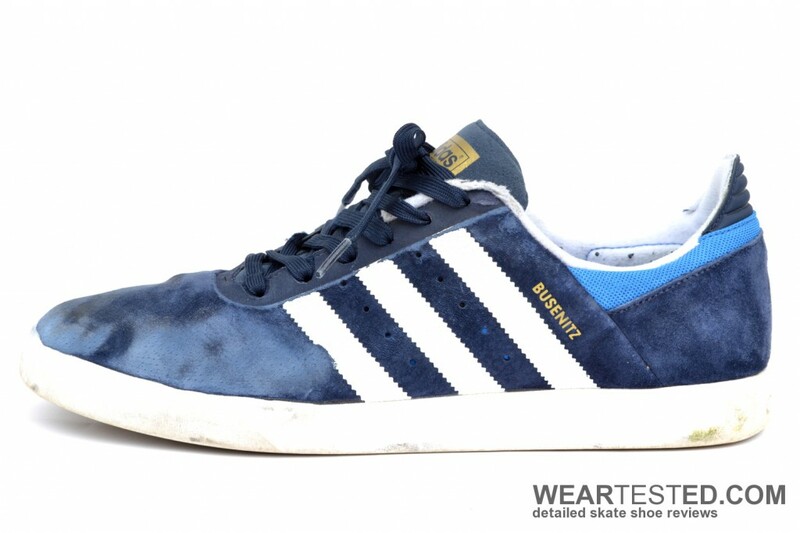 The Busenitz ADV is especially recommended for people with wider feet. Boardfeel and grip are two more strengths of this model. The thin forefoot area and sockliner in the first third of the shoe create a very close connection between foot and board. As the sole is very thin in the front and quite thick in the last third, the balance between cushioning and direct contact to the board is executed really well. This is additionally supported by the flexibility of the sole unit. Due to the thin treat pattern and the medium thick sidewalls of the sole it adapts very well to the concave of the board, especially for a cupsole. Additionally, the pattern with its fine lamellae structure ensures outstanding grip on the board and does not fail to match with vulcanized soles. 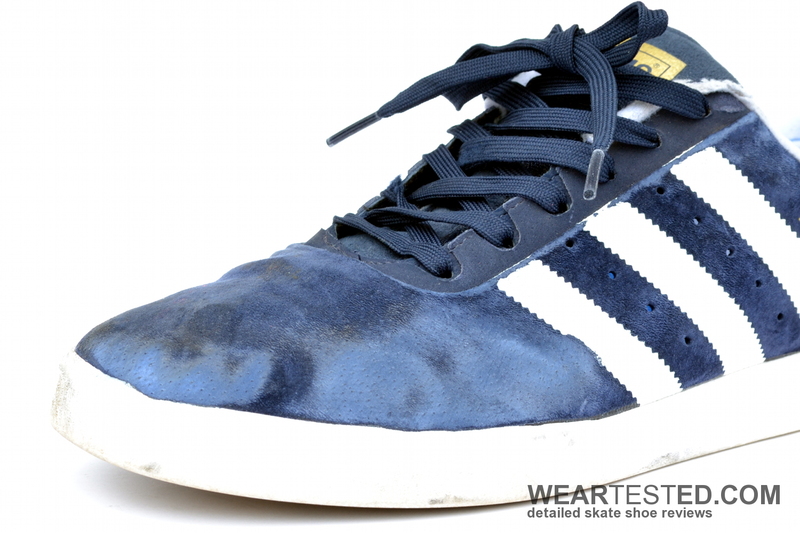 Going against the wave of the general trends, the Busenitz ADV relies on a rather high cut around the Achilles tendon. This, along with the ‘geofit”-technology creates a snug fit around the heel without impairing the movement of the ankle. The tongue features two longitudinal pads along the inwards facing side, which prevents it from moving to the sides and protects the foot from getting hit by your board without giving it a bulky look. The inner lining basically has no seams and the reasonable amount of padding around the heel ensure a snug fit and protection of the foot. Overall the workman-ship of the Busenitz ADV is remarkable, which increases the comfort further. The already mentioned sidewall ventilation due to the large ventilation holes that are pierced through the complete upper is outstanding; unlike many other shoes, the ventilation actually works, well done. The thin mesh tongue facilitates air exchange further. The stability is just as you would expect for a cupsole model. The Busenitz ADV offers just the right amount of support and stability for such a shoe, nothing more and nothing less. However, a slightly more rigid plastic reinforcement in the heel would be appreciated. 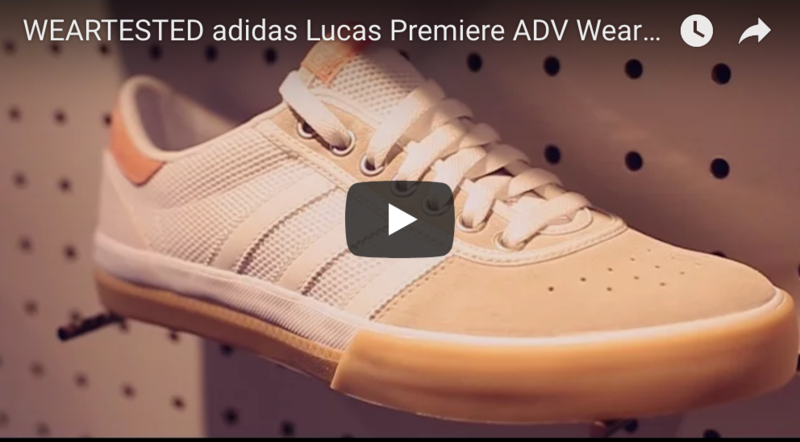 The adidas Busenitz ADV proves that a skate shoe doesn´t need to be highly technical. The well-thought-out details define the shoe’s strengths. Apart from the slightly shallow tread pattern of the sole and the average cushioning, the ADV performs exceptionally well.